Chain up your tires to make snow worries a thing of the past. With a large portion of the country preparing for a winter storm this week, getting out on the roads can be a dreadful proposition. Getting stuck seems almost inevitable - either you’ll get stuck in traffic or your car will get stuck in mounds of snow. The only solution to the traffic is staying off the roads entirely. When that's not an option, you can prevent the second ordeal with tire chains that add traction so you can make it to your destination safely. If you're new to the concept of tire chains, we'll give you a rundown of how to use them and all their pros and cons. We'll also share the best tire chain options available so you're prepared for anything Old Man Winter chucks our way next. Tire chains are made from either a web of chains or cables that go around your drive wheels when you encounter heavy snow and ice. When you come across a stretch of snow-covered road, you can pull your vehicle over and chain up your tires to make it through the heavy stuff. Since all states have their own restrictions on tire chains, make sure you're familiar with the rules in the area where you'll be driving. Tire chains significantly help with traction in snow-prone areas like the mountain regions or rural roads. There are many benefits to having a set in your vehicle, ready to go. 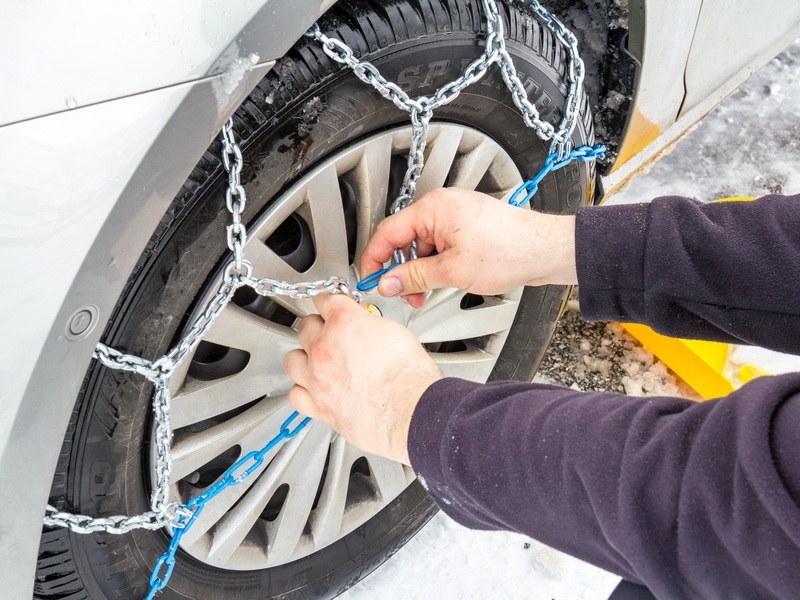 Compared to winter tires, chains are easier to take on and off your car and you can keep them in your trunk or cargo area all winter for emergencies. In addition to the ease of installation, tire chains offer better traction than winter tires for snow-heavy areas and they are much less expensive (most range between $40-100). Although they provide a simple, inexpensive solution to give you peace of mind, tire chains can only be used in very specific conditions. Unlike winter tires that can stay on all winter long and go on snow, ice or clear roads, tire chains are made for heavy snow and ice covered roads only. You should not exceed 30 miles per hour with the chains on your tires to prevent damaging the roads or your vehicle. This means that when the snow clears up or you need to hop on the highway, you must remove them. Choose from one of these durable tire chains based on your vehicle type and your desired price point. Each offers simple installation and great traction to give you confidence when driving on snow-covered terrain. The Security Chain Company SZ143 Super Z6 Cable Tire Chain ($71) can be used on passenger vehicles, SUVs or trucks. This model was specifically designed for vehicles that have limited clearance around the drive tires since it will operate in less than half of the space (.25 inches) required by most other tire chains. The diagonal pattern of the durable alloy steel chains offers serious traction when navigating through snow and ice and the coils are designed to protect your rims from scratches. Installation is also worry-free with two fastening positions that allow you to install the chains without moving the vehicle. With the same excellent durability as the SZ143 model, the Security Chain Company ZT729 Super Z LT ($91) is tailored to fit SUVs and pickup trucks. Featuring larger and tougher components for more rugged vehicles, this model will work well with anti-lock brakes, traction control, all-wheel drive and other control systems. With a built-in rubber tensioner, the chains will automatically tighten so you can get where you're going without having to pull over and manually tighten them. If you don't live in an area that requires tire chains often but you want a set you can keep in your trunk for emergencies, the Quality Chain Cobra Cable Snow Traction Tire Chains ($37) will be ideal. Although not as heavy-duty as some of the other options on this list, these chains are a great value for under $40. The carbon steel rollers are built for traction and for long wear and there is no need to worry about rust because they are fully galvanized. You'll notice reduced noise and vibration compared to other tire chain products. The Peerless Auto-Trac chain ($79) is hassle-free to install (no need to jack up your vehicle) and also to drive on since it self-tightens automatically. Its diamond-shaped pattern gives you optimal traction in snow, ice, and mud. The manganese alloy steel links are designed to be narrower and lighter than conventional ones, giving you more gripping points. These tire chains will fit most cars, SUVs, and trucks and allow you to go through deep snow without feeling a ton of vibration. This inexpensive alternative to traditional snow chains is as tough as nails when it comes to driving through the deep snow. Unlike actual nails, these anti-slip car tire chains ($49) ensure your tires stay protected. This set is made from light-weight materials making it simple to transport but durable enough to take on snow, mud, and sand. You'll get a set of 10 simple to install chains which fit most vehicle tires. Safely use them in nearly any conditions including the cold since they are resistant to freezing temperatures down to -50 degrees.